The brilliance of horses and horsemen on display during the Del Mar summer racing season carried over in a large measure to the 2018 Breeders’ Cup World Championships last weekend at Churchill Downs. And over the course of the two-day event in Louisville, fans who attended the 36-day, 79th racing season here had moments to remember echoing in their minds. First, the ones generated by the horses. 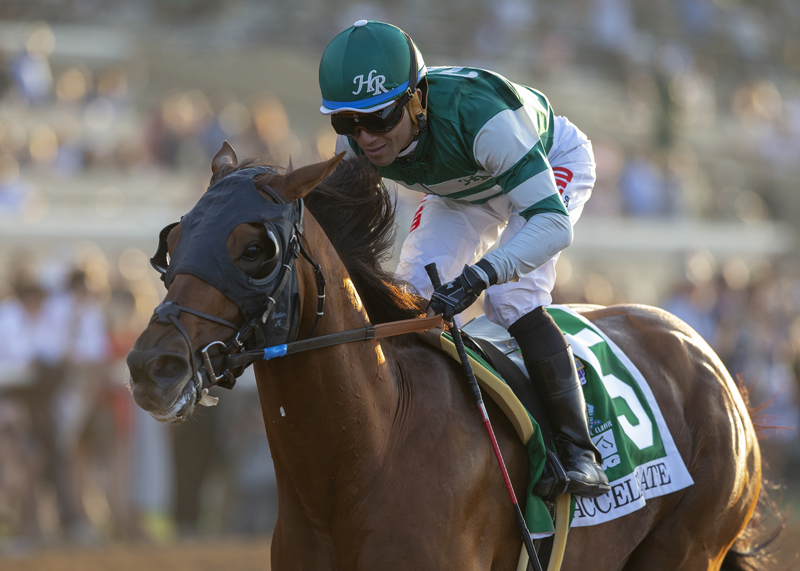 Accelerate, Del Mar’s Horse of the Meeting via a record 12 ½ length victory in the $1 million Pacific Classic, won the $6 million Breeders’ Cup Classic. The margin (one length), wasn’t nearly as impressive, but it didn’t have to be considering the competition was the best handicap division horses in the world. And it put Accelerate solidly in the debate/conversation for Horse of the Year, an honor that Triple Crown champion Justify appeared to have sewed up. Game Winner, the Del Mar Futurity champion and top 2-year-old of the summer meeting, overcame several obstacles to produce a 2 ¼-length victory in the $2 million Juvenile. It locked up an Eclipse Award as the year’s best 2-year-old male and secured early favoritism for the 2019 Kentucky Derby. Five Del Mar Futurity winners have gone on to Derby success, most recently American Pharoah and Nyquist back-to-back in 2015 and 2016. Stormy Liberal, who won twice at Del Mar in the summer, the second coming in the Green Flash on August 17, won the $1 million BC Turf Sprint. The wins here were both by a nose margin for the fast-closing gelding. In the Breeders’ Cup he stretched it out to a neck. Roy H, second in the Bing Crosby last summer, took the lead after a half mile and maintained it through the final quarter for a comfortable 3 ¼-length win the $2 million BC Sprint. City of Light, who broke his maiden at Del Mar in 2017 and trained here last summer, won the $1 million Dirt Mile wire-to-wire from the No. 1 post albeit at the expense of favored Catalina Cruiser. A victory in the Pat O’Brien was the “Win and You’re In” entre to the Dirt Mile for Catalina Cruiser and turned the vote for top sprinter of the summer meeting in his favor. Now for the human stories. John Sadler, who led all trainers with eight stakes wins during the summer, ended an oh-for-44 siege with the victory by Accelerate in the Classic. In addition, Sadler saddled Catapult to a second-place finish, edged out in the final strides by Expert Eye in the $2 million Mile. Encinitas’ Peter Miller, who ran away with the summer racing title by notching 31 victories to 21 for runner-up Doug O’Neill, pulled off the astonishing feat of winning the same two Breeders’ Cup races he had at Del Mar in 2017, with the same two horses. That would be Stormy Liberal in the Turf Sprint and Roy H in the Sprint. Miller entered Roy H in the Pat O’Brien, but scratched on the day before when he decided the race spacing wasn’t right for optimum Breeders’ Cup preparation. Victories by Roy H in the Santa Anita Sprint Championship in October and the BC Sprint proved the wisdom of that decision. Drayden Van Dyke, who won his first major Southern California circuit meeting title here last summer, experienced his first Breeders’ Cup win – at age 24 – aboard Stormy Liberal. Trainer Mike McCarthy, a former Todd Pletcher assistant now based in Southern California, did likewise with City of Light. Trainer Bob Baffert, who has won the Futurity 13 times, took the BC Juvenile for a fourth time with Game Winner following Vindication (2002), Midshipman (2008) and New Year’s Day (2013). And Hronis Racing, of brothers Kosta and Pete Hronis, who won their fourth owners title in the past six years at the summer meeting, took the honors at the Breeders’ Cup with more than $3.3 million from the win by Accelerate and sixth by Catalina Cruiser. The supplemental entries of Miss Southern Miss and Gliding By finalized a field of 12 with one also eligible for the $75,000 Kathryn Crosby Stakes on opening day, Friday, November 9. The one-mile run for older fillies and mares over the Jimmy Durante Turf Course is the first of 14 stakes during 16 days of fall racing at Del Mar that will be conducted on a four-day per week basis. The opening four days conclude with a special Veterans Day program on Monday. Thereafter racing will be staged Thursday to Sunday. The field for the Kathryn Crosby from the rail out: Gliding By (Evin Roman), Psycho Star (Edwin Maldonado), Miss Southern Miss (Assael Espinoza), Excellent Sunset (Mario Gutierrez), Shehastheritestuff (Geovanni Franco), Quebec (Rafael Bejarano), Way to Versailles (Flavien Prat), Tonahutu (Gary Stevens), Escape Clause (Ruben Fuentes), Sweet Charity (Mike Smith), Last Promise Kept (Drayden Van Dyke) and Pantsonfire (Kent Desormeaux). Also eligible: Birdie Gold (Mike Smith, 1st call). The installation of sprinkler systems in structures as San Luis Rey Downs continues to rebuild from the devastating fires 11 months ago will necessitate an influx of horses to the Del Mar stable area. Among that group are Peter Miller, Ed Freeman and Adam Kitchingman. A rough guess would be that about one-third might be sufficiently trained up to a start during the upcoming meeting. “From my standpoint, if they’re stabled here, they’re on the grounds and you just need to lead them over to run, so it could be a positive for us,” Jerkens said. CLOSERS – Del Mar Executive Vice President of Racing Tom Robbins attended the Breeders’ Cup and, after talking with Chad Brown, returned with the expectation that the mega-trainer will be sending several horses west for the meeting and will be especially well represented in the Hollywood Derby and Matriarch Stakes on the closing weekend, December 1 and 2 …Hunt, voted top grass horse of the 2017 summer meeting off victories in the Eddie Read and Del Mar Handicap, was entered in the Breeders’ Cup Mile but didn’t make the plane to Kentucky after running a temperature. Owned by Michael House of Rancho Santa Fe and trained by Phil D’Amato, Hunt is being tentatively targeted for the Grade II $200,000 Seabiscuit Handicap on November 24, a race in which the 6-year-old Irish-bred earner of more than $900,000 is the defending champion.